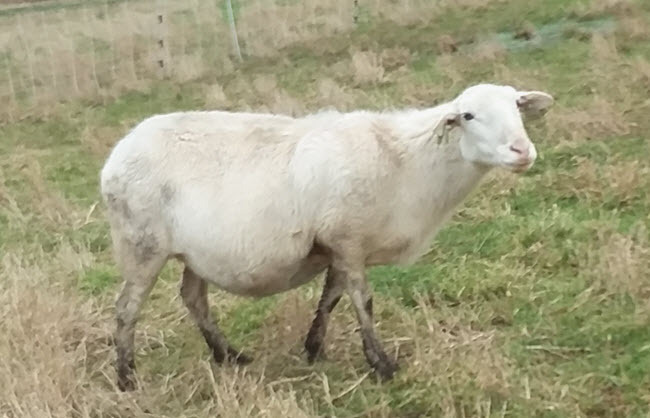 This is a classic white ewe, good mother, has raised 10 lambs in six years. She has very strong growth and milk scores, and positive lamb survival. I’m dropping her because of her lower NLB data, which is sourced partly from her family tree, as this ewe has been a pretty consistent twinner herself. She is seven this year, and likely to have another 4-6 good years of twinning left. This pedigree has some diverse genetics, both “old” WA stock from Bert Martineau, as well as North Dakota State University, plus a little Dorper thrown in for good measure. Photo taken January 2019. EBVs from 2018 lamb crop EPWWT/PWWT weight data. Lambing record starting as a yearling: 1/1, 2/2, 2/2, 2/2, 1/1, 2/2. She is bred to KMC7018, due to lamb in April. Price is as an exposed/bred ewe, price will raise once she has lambs at side.